...since I last set foot in this forum. In that time, I got swept up into a completely new and unrelated fandom, changed my all-purpose internet moniker to Dots (Dots Salchow if you want to be precise) and learned quite a lot about myself. Though I've grown much wiser and less cringy in the time that I was gone, I still haven't forgotten about the quirky gentleman thief. I've still kept up to date with developments in the franchise through social media, so I already know about most of what's happening on that front. Anyway, what's the haps over here? Often caught but never held for long, Lupin III brought the gentleman-thief into this century with his hi-tech antics and old-world charm. Unless something has changed about the forum settings, you can change your display name to something else while using the same login credentials. So you'd still login as geckgirl191 but you can change the display name to Dots or Dots Salchow or whatever. 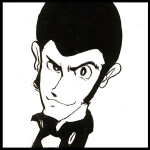 I still login as "Lupin the Third" but now everyone sees me as Reed and it's kinda nice. Not much has been happening here; the forum has been much slower since even just a few years ago for reasons I still can't pinpoint. Hey, welcome back! I've recently come back myself after taking a hiatus from the franchise for a while before falling head-first back into it a few months ago (I blame the trailer for Blue Jacket reminding me why I love it). Glad to see you've returned! I still haven't found the way to change my display name through the account settings, so it looks like I'm kinda stuck with it here. It doesn't bother me all that much, tho. As for forum activity, I'm only slightly surprised that it has remained pretty slow. I would've imagined maybe a bigger influx since the new anime and the re-licensing of older titles. Then again, that doesn't always guarantee a rise in popularity. The reason why I decided to come back was mainly due to nostalgia. I'm a long-time watcher of Bennett the Sage's review series Anime Abandon, and his recent announcement that he's going to review Castle of Cagliostro got me stoked (the announcement is at the end of his Robot Carnival review, before the credits).